Like it or not, the city is becoming the lifestyle model for most of humanity. And you may be forgiven if your first image is the condo-residing, transit-commuting fashionable type who is always two electronic clicks away from the answer to any question. If we put on our global lens for a minute, we can take the biggest American city — New York — and see that it is only about as populous as Tehran, and eclipsed in size by 17 other cities, 14 of which are in Asia. That continent is facing an explosion of megacities that contain large sub-populations extremely vulnerable to multiple stressors such as poverty, exclusion, violence, illness and natural hazards. Some live in shanties built in the floodplains of Manila — that actually do flood. Others try to defy death in garment factories in Bangladesh. The UN estimates that 93 percent of urban growth will occur in developing countries, with 80 percent in Asia and Africa. In fact, Asia has already outpaced the rest of the world in consumption of raw materials. These cities are well into the type of industrialization the West started a century ago and they want to catch up but they won’t — they can’t, unless we colonize some other planet. In the US, for every free-spirited person who gives up a city profession for a bit of the country life, more people leave for the city, and in a country that is already 82 percent urbanized. In the US, for every free-spirited person who gives up a city profession for a bit of the country life, more people leave for the city, and in a country that is already 82 percent urbanized. Many cities have taken advantage of proximity to realize efficiencies in economics, transportation and land use, yet some cities see limited social and environmental benefits. So what makes a city sustainable? Now academics and policymakers have realized that the single-solution, plan-and-implement model is weak, so some cities are looking towards a transition management (TM) framework. A European import, TM recognizes that society evolves through interactions between technology, culture, institutions and other forces that sometimes do good, but often lock us into predetermined outcomes through inertia and vested interests. If you don’t believe it, ask yourself why you are not plugging your car into an electrical outlet instead of still pumping US$75 of petroleum at every fill-up. In complex systems like city operations there are high levels of uncertainty where a planner cannot even estimate what the best course of action is. Rather than guessing and risk being wrong, a TM approach would start by converging ideas on a long-term vision instead of a short-term goal, reaching broad agreement. In the Dutch case this had the government facilitate multi-stakeholder forums. The orientation then turns from problem solving to mutual learning, overcoming reliance on technical fixes by incremental experiments in business strategy and policy. These strategies do not all work, but the few that do steer societal change in the desired direction, ideally aligning diverse interests. The approach can be more effective because it doesn’t attempt to solve a problem with one solution. 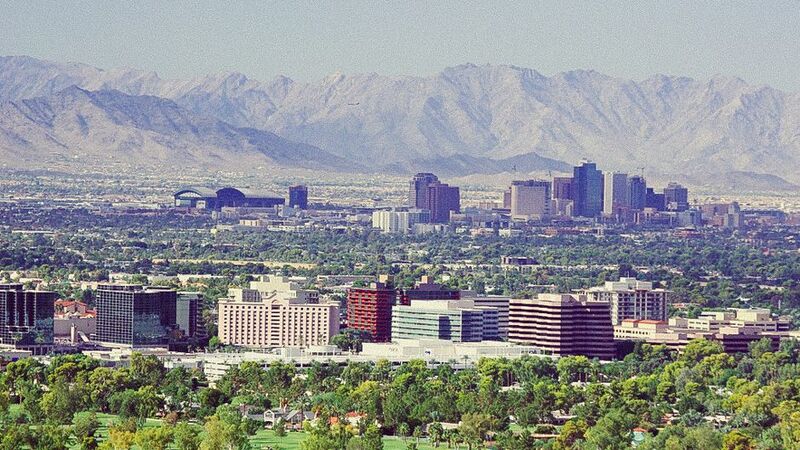 Basically it’s a grand experiment in transformation, and Phoenix is one city that has partnered with, among others, Arizona State University’s (ASU) School of Sustainability to use this framework to update the city’s transition pathways in the General Plan. Asked what makes Phoenix a good candidate city for this partnership, Professor Arnim Wiek, involved in the project, says the answer is easy. “If we can create sustainability in Phoenix, we can create it anywhere,” he says, quoting Andrew Ross’ book Bird on Fire: Lessons from the World’s Least Sustainable City. Faced with severe budget cuts and an unworkable planning document for the city, the Phoenix Planning Department partnered with ASU to develop a transitional vision for Phoenix and strategies to reach it. An early draft pursues a strong local economy, a mix of global and local businesses, industry focus on medical research and development, and businesses participating in civic engagement. We focus on solutions exploring which transition pathways are viable for complex urban systems in collaboration with stakeholders across the city. The project is city-led, lending it political legitimacy. Involving not only professors but also graduate students gives them an opportunity to work on solution oriented, practical research — in other words, operationalize TM theory to better their own city. Wiek says the process is fully supported by Phoenix mayor Greg Stanton, who has committed to a stronger urban sustainability agenda under his leadership. The next step has already been set in motion. It is “Re-invent Phoenix”, a US Department of Housing and Urban Development US$2.9 million grant that builds on the previous effort to focus on the light rail corridor to meet the city’s vision of transit-oriented development. These initiatives are demonstrating how academic partnerships with business and local governments can elucidate new possibilities for sustainability with transitions in thinking that accompany changes in technology. And what a nice thought that is. This article resulted from a larger project compiling North American City Sustainability Indicators. Transforming the World’s Least Sustainable City by Darek Gondor is licensed under a Creative Commons Attribution-NonCommercial-ShareAlike 3.0 Unported License.